Just came to know from comment that Lohit Tamil is used in Unicode charts from 7.0 onwards. I did quick comparison with old Tamil chart and 7.0 and yes that is Lohit !! Kudos to Shriramana for making this happen with proposal. I remember we were talking about this last year and due to OFL license of Lohit it is easy to use it in Unicode charts without any permission. This add more responsibility to make sure Lohit Tamil follows and keep glyphs consistent in future version. I am sure with strong community we can achieve it. I have been always proposing Unicode for using opensource fonts in there charts. 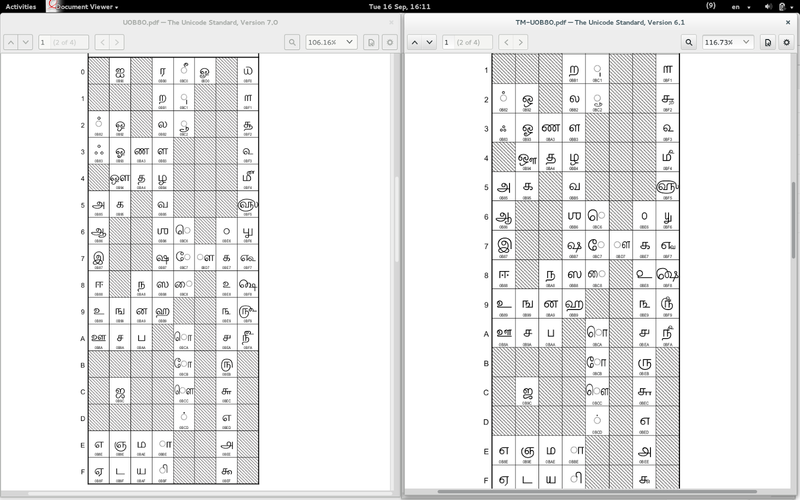 Unicode definitely spending some money to make fonts for these charts, so why not to release these charts under opensource license? Second part that is faced specifically in complex script, is reference for rendering rules. Yeah, this can add additional overhead to Unicode but i strongly feel it can help further to have standardization in complex script rendering. Anyway we are already trying for this with Lohit2 project, hopefully other script fonts project will also start this kind of initiative and in long term font designers will be free from worry of rules for complex script rendering. Again glad to see this is happening ! !